For a fair number of years we had a pile of old fence boards leaning up against the side of the house under the overhang, just below the dining room window. Wood from these boards was used for our picnic table, the chairs that go along with it, tables for pots, planters, the shade screens in our pergola, the shelving holding our plant pots, the barrier screens on the garden's perimeter boxes, it doesn't matter where you look in our backyard, you will have something in your line of sight that contains those recycled fence boards. As you look around our yard, more so in the back than in the front, you will see ample evidence of how used items and materials are recycled and have either been turned into something decorative or useful for purposes other than originally intended. For example, take the wind chime in the left of this picture. It comes courtesy of our friends Rick and Sue, up in Quesnel, where Rick used piping found in an old mill to fashion this (sometimes) soothing addition to our yard. 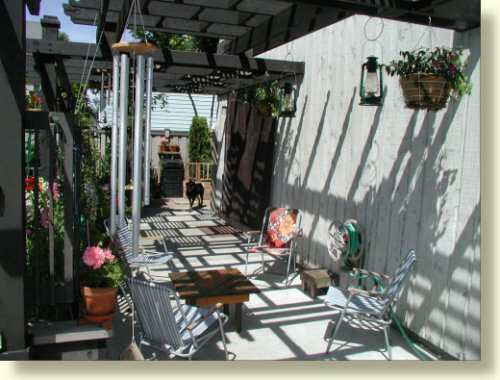 The pattern you see created by the shadows on the patio, just in front of the dog, are from screens made from boards of the old fence which were dropped into place on the pergola. The table in the foreground is made from, again, recycled boards from the old fence. The barrier screens on top of the planter behind the dog, same thing. 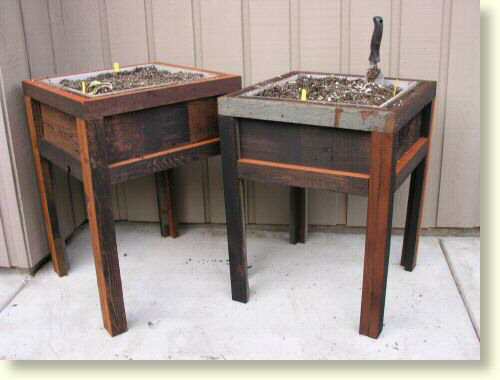 Here below is an old Beatty wringer/washer and a galvenized wash tub have been used as planters. 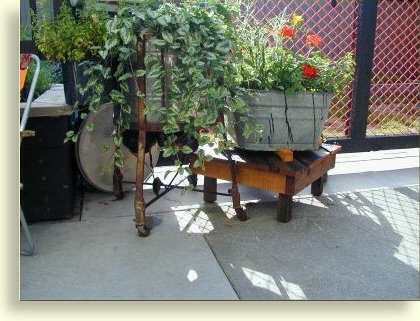 The wash tub sits on top of a table made from, you guessed it, recycled fence boards. These stands/planters started out as fence boards almost 30 years ago (sound like a familiar theme?) and these old boards have served as raw recycled material for a variety of projects around the yard since we started to replace them about 6 or 7 years back. Initially we made these as little 'boxes' that would hold four of the 140mm (5½") pots with some herbs in them. We put them out in our plant sale last spring, and while they generated some interest, nobody bought one. So, over the Easter weekend 2005 we thought we'd transform them into little stands and to see if we fare any better with them in our next plant sale. They still don't go, the pots came out and we lined the box with some Coroplast and turn it into a full-fledged planter, very much like what you see directly below, only a little smaller. These little guys measure roughly 10"x10"x6", the bigger ones below are more like 16"x16"x8". The 2 planters you see here -on stilts to keep them above Keats' leg reach- are not only one of the last projects these boards are being used in, they also occupy the very area those boards were stored for the last few years. The stack of boards had become a rodent den over the winter (I suspect the rat that ate our Helleborus buds and flowers made its home here) and it just had to go. Well, with that stack gone the whole area opened up visually and looks a lot more inviting. A round planter/pot on one of the tables I made the end of March 2005 (Easter weekend) will be added to this small grouping and seeing as they are in an area that sees hardly any direct sunlight except for later in the evening in the summer months, they will be used for a small collection of shade tolerant perennials such as a couple of Hostas -'Brim Cup' and 'Striptease'- in the left one and some Cyclamen in the other, perhaps with a Bleeding Heart. 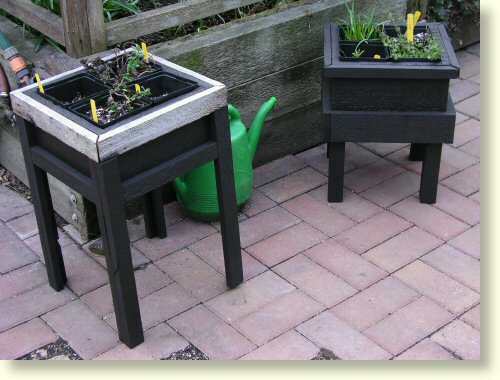 As said, that 2005 March 26th weekend was, among other things, spent building these 3 little tables. They're all freshly stained now, so fresh as a matter of fact that you can see the rain water still beading up on them. One of these will end up with the two planters above. 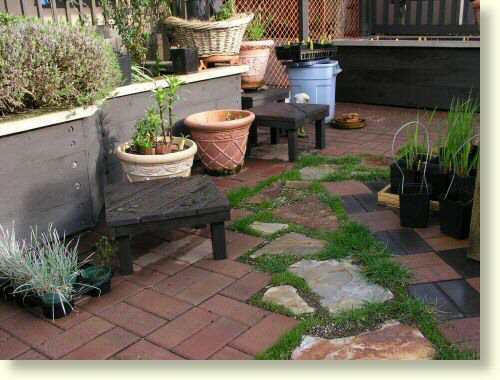 The whole arrangement of these 3, the two planters and the table, will very nicely break up the relatively bland looking north side of the house with some colour, texture and a variety of shapes and sizes. As nice as these planters were originally we have had a change of the canine guard since they were first built and the new canines just LOVE to go after leaves of almost any variety. We had a very nice Hosta 'Striptease' growing in one of the large boxes, nicely tucked in the corner you see above and dear Neka simply put her front paws up in the edge of it one day and proceded to eat about half the leaves off the poor plant, so it had to go from that location. The planter spent 2008 in the backyard, but Pieter decided in April 2009 that it was time to dig up the Striptease and divide it. With the planter now empty we thought we'd do away with that style of container in favour of the more colourful fired pots you see these days, so 4 of them have now found a home at the neighbours -best to give them a new home then to throw in the landfill. Guestbook use seems to have fallen out of favour, so we have deleted it, but, if there's something you'd like to say, simply use the form on the contact page.